I recently read two books I’d like to share with you. When I first saw Rory Miller’s work, I thought “Here’s a guy who has been there, done that, and makes sense.” That impression was reinforced later when I met the man and had a chance to talk shop with him at some length. His long background in Corrections has exposed him deeply to “the face of the enemy,” and given him much real world experience within which to correlate his extensive background in the martial arts. 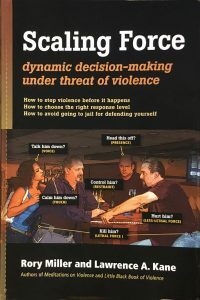 Rory got together with Lawrence Kane to write “Scaling Force: Dynamic Decision-Making Under Threat of Violence” (YMAA Publication Center, 2012). The first half of “Scaling Force” is a well-presented overview of the nature and psychology of physical violence. The second half goes through the old six-step force continuum, at each point explaining how things work with lots of examples from real life cases. Level 1 is Presence: how not to be the you-know-what who inadvertently starts a fight, and how to make it clear to a predator that you are not prey. Level 2 is Voice, and the authors do a superb job of presenting vocal de-escalation tactics whether it’s a family gathering that becomes argumentative or something more serious. Level 3 is touch, from calming influence to redirection. At Level 4 things get more serious with empty hand restraint and physical control. Level 5 is Less-Lethal force, from hard blows to potentially neck-breaking holds to pepper spray and the TASER™. It tops out at Level 6, Lethal Force. All is presented with logic and understanding of both law and ethics. 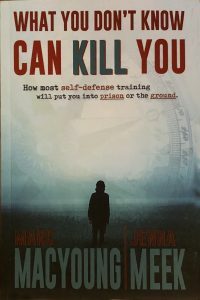 Marc MacYoung and Jenna Meek are old friends of mine, and together they wrote “What You Don’t Know Can Kill You: How Most Self-Defense Training Will Put You In Prison or In the Ground” (Carry-On Publishing, 2018). Jenna teaches firearms along with her husband Jeff, and Marc is famous for his books on hand-to-hand fighting, the use of the knife, and related topics. Together they make it clear that on one end of the spectrum, “Just let the criminal take what he wants” is poor advice if what he wants to take is your life. They make it just as clear on the other end of the spectrum that the common martial arts “dance of death” sequence in which you stomp on your opponent’s neck after he’s down and out can end with you having some very unpleasant experiences in the prison showers. Each of these books would make a useful gift for many in your life, particularly those lovable friends and relatives who think the world is full of moonbeams and butterflies and that people who would harm innocent others are creatures of a paranoiac’s imagination. Sure would like something that instructs how to do street “profiling”, rather than reacting late to an attack. Both aforementioned books are by great (and trusted) authors as well. Both authors share information that was hard to come by when I needed the ‘real deal’ stuff to deal with the amount of violence I was subjected to or could be subjected to during the course of my career. Both gave me advice and help along the way, directly as well as through their writing – “been there, done that” barely scratches the surface for the two excellent resources, that I can’t recommend highly enough. Thank you for recognizing what I’ve known and relied on for years! Thanks: I have the book but it doesn’t go into specifics (or I must have missed it, filtering out the irrelevant parts), especially for civilian type encounters. By that, I mean the body English of the nefarious. Many people don’t realize that many gang-banger types actually practice and study how to set people up with an eye to dodging arrest/prosecution if it goes wrong. Today, in our pop-culture, even the innocuous look sketchy. Mas I remember an article you wrote some years ago when I was working as a mental health nurse a repeat may be useful. I read a lot of Marc MacYoung’s posted stuff in the early days of the Internet. Those were the days when he went by his street name, “Animal”. He definitely knows what he is talking about and what he tells you is not pretty. Generally, if you are being “interviewed” by a thug (targeted), then you can tell somewhat from furtive glances on their part. The best thing you can do is “telegraph” your awareness to everyone around you. Don’t be talking and laughing with friends while walking down a strange/dangerous street. Put the damn smart phone in your pocket and look around you. Stare at no one, but glance at everyone. Keep your head on a swivel. The street thug has enough experience that he can tell when you cannot be surprised and you will fail the “interview” and he will move on to someone else that has their head in their smart phone. The thug needs to catch you completely unaware so you will just collapse into doing what your told and not resist. Make sure he sees that you cannot be surprised. I am no expert (by any stretch of the imagination), but I spent 18 years working on the eastern edge of downtown Houston and walking to and from my car in the dark (before sunup and after sundown). I had to walk several blocks and the surrounding buildings were abandoned and looked like bombed out Warsaw (all gone today with new ballpark, convention center, etc.). Many places to be ambushed on the sidewalk. I survived because I took it slow, steady, and aware. It didn’t help my profile that I wore a business suit and carried a briefcase. This was also before Texas allowed concealed carry, so the only thing you could legally have was your wits. The traditional military policy on fighting has been if a serviceman gets in a fight he must not have thrown the first punch, or he will be held at fault and shall be disciplined. I like the late Colonel David Hackworth’s personal policy better. If somebody in a bar starts to give you the evil eye, it is best to get in the first punch, and then get the heck out of the bar area before the authorities arrive. it has worked for me. Just food for thought. I have a friend who has apparently jumped justifiably on a few necks, too. Steve, I don’t think your local prosecutor’s office will agree with Col. Hackworth. I just stay away from the bars. More peaceful for me that way. I once asked Dave what he was like in Junior High School, having taught some myself. He said that he got into fights every day after school! Of course, he later earned 10 Silver Stars in Army combat. Fighting was definitely his niche. A brilliant leader, he gave our enemies fits. He would approve of both the books you are sharing, though, for their value in promoting awareness, self-preservation, and harmony. Getting into bar fights? Throwing the first punch? Aren’t there always witnesses in bars, and nowadays probably cameras too! Hafta agree with Mas. Consider that Sun Tzu said the best general was not the one who won battles. The best general was the one who accomplished his goals without fighting. I’m sure we would agree that the USA has the best military. Sun Tzu might believe that Switzerland has the best military. They train for war, but never go to war. I have walked away from several serious physical attacks from misguided opponents during intense “pick-up” basketball games, for example, because I decided that walking away in the moment was possibly a better choice than than clobbering the aggressors, even if they were deliberately injuring me. I felt that my intentionally injuring somebody, even in a case of self-defense, could result in criminal charges for me, as well as banishment from the basketball court. Still, occasions can occur where you may need to act aggressively in self-defense. Preparation is necessary to enable immediate-and-right decisions that involve violence. Moreover, video tends to be overrated. It often carries a limited point of view. I am conservative, have taken classes from Mas and John Farnam, and have never voted for a democrat. I’m also MTF transgender. I work very hard at not attracting attention, not putting myself in places where trouble might erupt, and if something starts to look dicey, I get out of Dodge. Considering that even the most perfect shooting is going to come with six figure legal bills, and a whole host of headaches, I’d just assume avoid if at all possible. And yes, I don’t go out after 11 PM, and avoid being in places populated by inebriated young men. It’s kept me safe for 50 plus years so far. I agree with you. An armed citizen (generally) has no duty to be the hero and “take out the bad-guy”. We are not the police and we are not soldiers. There may be special circumstances where the citizen is forced to intervene but that is, in my opinion, the very rare exception rather than the rule. In my opinion, our first line of defense ought to be situational awareness, the avoidance of trouble and retreat. The gun should come out only if it is necessary to drive off the attacker and open up a line of retreat. Several simple minded observations that I’ve found helpful and allowed me to stop three youths from robbing an old lady with a street setup when I was young, stupid, and unarmed were first, be alert to things out of place or out of the ordinary of your surroundings and second, honest people move along, predators lurk. I’m sure there are many sophisticated additions to these by more informed people.